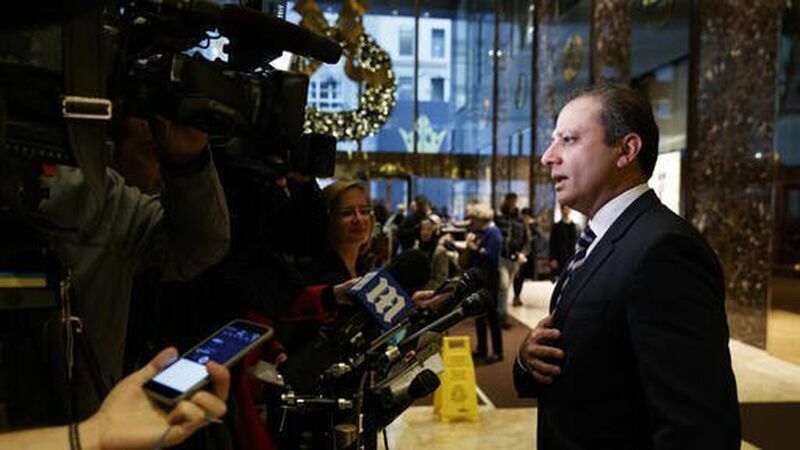 Why did Trump insiders instantly know that the "Sheriff of Wall Street," Preet Bharara of Manhattan, would be fired when he resisted President Trump's resignation order to all the holdover U.S. attorneys? There's a school of thought that the whole purge was about Preet in the first place: He's a maverick, his Southern District of New York is powerful, U.S. attorneys have significant independence, and he has jurisdiction over Trump Tower. And he recently launched a personal Twitter feed. If Preet ever flexed his muscles to undermine Trump, he'd be hard to stop. Better to ax him when you can. After news reports yesterday that the prosecutor was resisting, Acting Deputy Attorney General Dana Boente gave him a buzz. An administration official tattles that Preet "refused to admit that this applied to him." "As we talked to him and tried to reinforce that it did, he basically said: 'I'm interpreting that to mean you're firing me.'" Preet then tweeted: "I did not resign. Moments ago I was fired." The N.Y. Times' Maggie Haberman and Charlie Savage later popped the tantalizing scoop that Trump's office had phoned Preet on Thursday. But the prosecutor hadn't called back because of "protocols governing a president's direct contact with federal prosecutors." "It seems pretty clear they weren't planning to fire them on Thursday, since Sessions held a call with all the U.S. attorneys across the country and wished them 'happy hunting' on cases. So what changed between that call on Thursday and them being all told to clean out their desks by the end of the day on Friday?" "Maybe it's the White House's paranoia that holdovers and civil servants are out to get them — Trump just finally snapped and ordered them all fired immediately. ... [T]hey took something that could have been handled the way past administrations handled it and instead chose chaos and put their actions under another cloud of suspicion." "It goes back to the fundamental question about so many things from this White House: What percentage of this mess is due to incompetence and what percentage is due to malfeasance? No idea, but you will have DOJ reporters and Democrats on the Hill digging hard into the question."